36 1/4 in. diam. x 4 7/8 in. 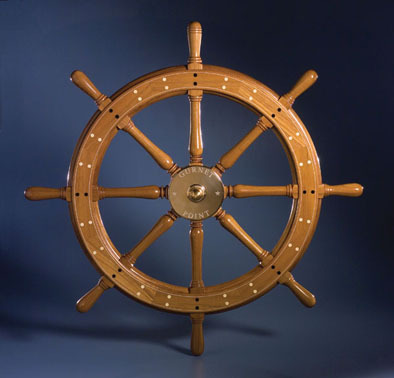 Bob Fuller may be Massachusetts' only hand-turned ship's wheel maker. Bob turns the mahogany spokes on a lathe. A minimum of five coats of varnish is required to achieve this high-gloss finish. He builds wheels around a bronze-plated hub decorated with engraving. He has been crafting them since 1977 and describes his wheels this way, "Some people have considered it to be a piece of furniture. But I look at a ship's wheel as being far more than a piece of furniture . . . furniture isn't made to stand up on the ocean in a really harsh environment. A ship's wheel needs to perform."